After realizing that since the opening of their vimeo page in 2008, they had produced and released 101 videos, Macneil BMX thought it might be the time for a powerful recap. 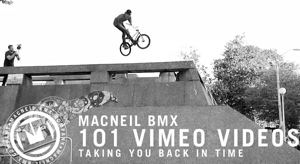 That is how we end up logically end up today with this Macneil Bmx 101 vimeo videos recap. At a time where a lot of brands have a hard time to find a coherent identity in term of team, a video underlining the highlights of a 4 years of Bmx within a team seemed more than welcome. Now of course I’m getting curious and might have a more precise look into it, to be able to give view a less naive report. But for now, let’s embrace the joy of nervous and exciting lifestyle video ! Press play !